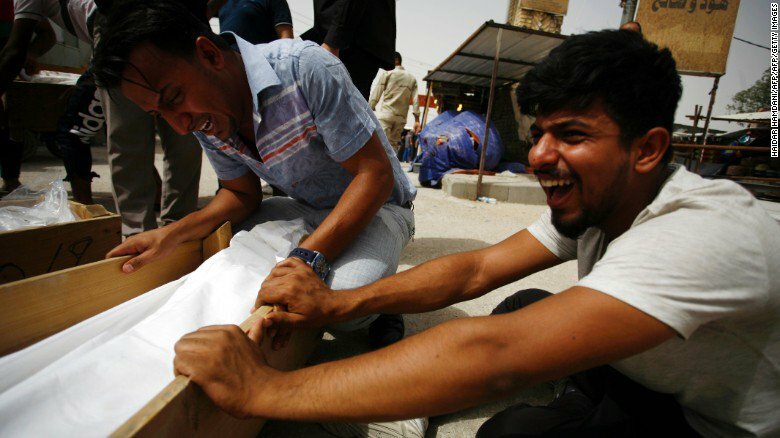 The Saturday night attack on a busy shopping district was the deadliest single incident in the Iraq's war-weary capital in years, killing at least 200 people, Mohamed al-Rubaye‎, the deputy head of the security committee of the Baghdad Provincial Council, said on Afaq TV Monday. One couple at the scene was searching for their teenage son who'd gone to a cafe with his friends to celebrate his birthday. Another man was looking for five of his relatives, including children, who were buying new clothes for Eid-al-Fitr -- the celebration that marks the end of Ramadan on Tuesday. ISIS claimed responsibility for the attack. It was the latest in a string of assaults during the holy month for Muslims, a period of fasting and prayer, and also a time when jihadists launch operations against those they regard as their enemies. Last month, a gunman shot up a nightclub in Orlando, Florida, and an attacker killed a police commander and his partner in France. ISIS has claimed responsibility for some of these attacks, while others were inspired by the terror group, authorities say.